When talking with atheists and anti-theists, the problem of evil in the world is often brought up. The common argument is that if evil exists, then God cannot be omniscient, omnipotent, omnibenevolent, omnitemporal, and omnipresent (premise). Evil does exist, therefore God is not these things (conclusion). This argument has several issues for Stoics, suppressed premises, which are all too common, aside (such as “a God that exists must be the “5 Omnis” type). The God of the Stoics is not a personality moving about the affairs of humans like chess pieces on a board. God is the universe itself, the ordering principle, and generative principle found therein. The above type of argument of against Stoic theology is wholly out of context. The theodicy of other faiths, traditions, creeds, whathaveyou are not a one to one compatible thing with Stoicism. In part, because the isssues they attempt to resolve are not all present in Stoic theology. The Stoic position on Good and Evil are personal, internal, and moral. There is no great evil force wrecking havoc in an otherwise peaceful world. What is evil, is simply a shadow cast by obstructing the light, not a force of its own. Good and evil, per Epictetus, lie only in the will, (Disc. I.25). I have no idea where I found this graphic, but it’s a good distillation of the Stoic moral landscape. 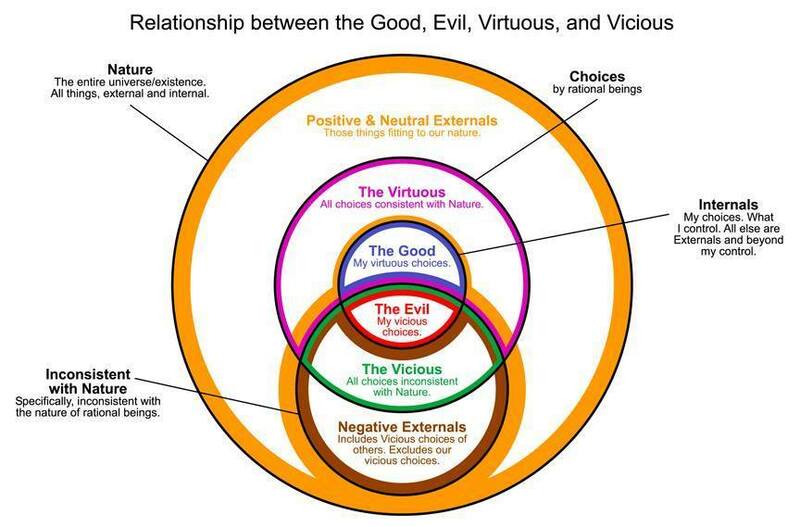 The smallest circle in the center which is bifurcated contains “good and evil.” This circle is My Possible Choices. Outside of that we can talk about virtuous, vicious, and indifferent choices: but Good and Evil are personal. That’s an important distinction to be made in contrast to the idea of “cosmic evil.” What’s in line with nature is either virtuous or indifferent, what’s contra-nature is vicious or indifferent. Only insofar as ‘i’ am concerned, is the idea of good and evil relevant. The Stoics do have a sort of cosmic optimism, in that the universe is working to some beneficial end, on the cosmic scale. What man deems a tragedy might not be so on the scale of the universe. In just 100 years how many on earth will remember our bad days, our losses? Maybe none. The universe is an awful big place, scaling that up… it looks bad for human concerns as a metric for universal operation.